Family reunions are events that focus on gathering family members and relatives to celebrate the bloodline of the family which had been passed from one generation to another. To have an initial head count of the participants, and to know who the participants are, a family reunion registration form must be created by the organizing committee. This document collects and records the basic information of the participants and registrants, as well as their preferences, needs, and expectations with regards to the event to be held. Event payment information: This is where the registrant will be able to know the dues and fees that he must pay for the reunion. In addition to the amounts to be paid, the due date is also stated in this section as well as the address and the account information of where the payments must be sent. Shirt sizes and preferences: This section is allotted for the specific shirt orders of the participants or the family members of the registrant. The shirt size of each participant along with the color and style are some of the data to be indicated in this section. Contact information: The registrant’s contact information, address, and email are some of the pieces of information which are necessary to be disclosed in this section of the form. Family members list: This section will consist of a table wherein the names, age, dates of births, and the addresses of the registrant’s family members will be listed. An indication of whether the participating family member will be joining the talent shows and games in the event can also be included in the table which must be marked by the registrant with a yes or a no. Additionally, a comments and suggestions section can be placed as the last section of a family reunion registration form as well. This will collect the insights and the ideas of the registrants and participants for the event. Also, concerns and issues of participants can be defined in this section to inform the event planners and organizers. This opens an opportunity for the organizers to address the participant’s concerns immediately, specifically during the registration period. 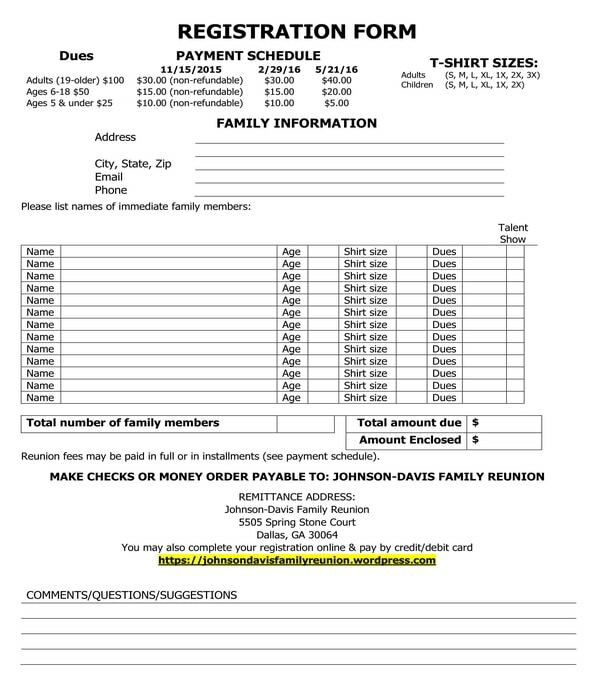 Family Reunion Event Registration Form – There are business companies and organizations who offer reunion services to their clients. And in order to collect the details of the client’s family reunion, a family reunion event registration form is provided to the client as a type of intake document. There are three sections in the form which must be filled out by the client. The first section is for the client and event information. The second section enlists the people who will be assigned as the organizing committee of the event, while the third section will be for the details of the event programs and the progress of the organizing committee. 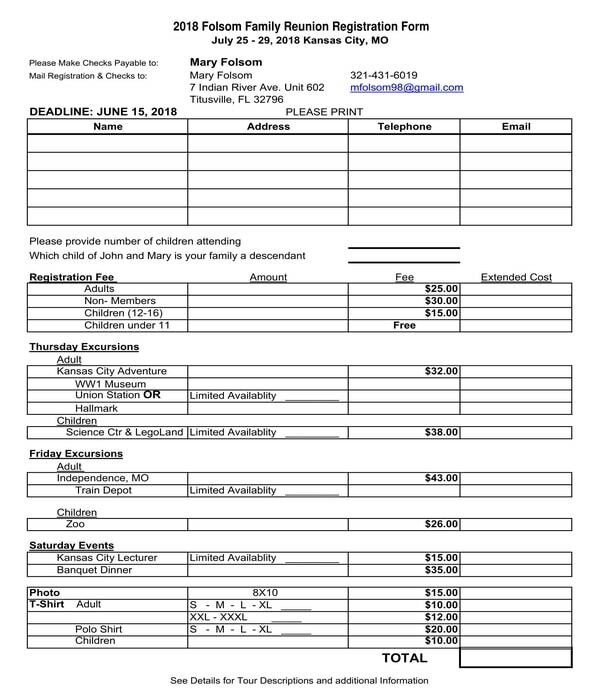 Family Reunion Schedule Registration Form – This form does not only collect the general information of each registrant or event participant but will also inform them about the day-to-day schedule of the reunion. The form will allow the registrant to state the number of children or participants who will be joining the daily excursions along with the fees to be registered in the activity, and the extended costs. Photo payments and shirt specifications are also included in this registration form variety. 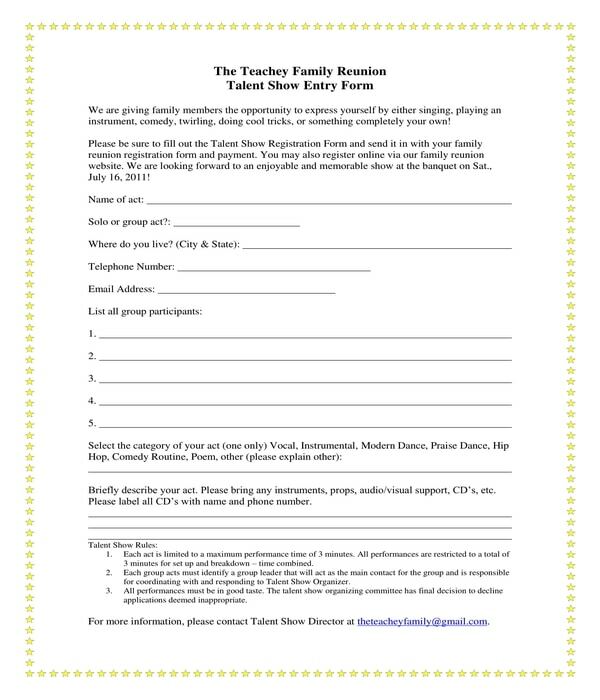 Family Reunion Talent Show Registration Form – Talent shows are one of the common activities included in a family reunion program since it showcases the abilities of each family in different generations. For this, a family reunion talent show registration form must be made by the event organizer. The form will have the name of the participant’s performance or act, an indication of whether it is a solo or a group act, the address and contact information of the participant as well as the category of the act. In addition, a brief description of the act will also have to be inputted in the form along with the label of the disk to be played and the name of the person who is responsible for providing the disk on the day of the show. 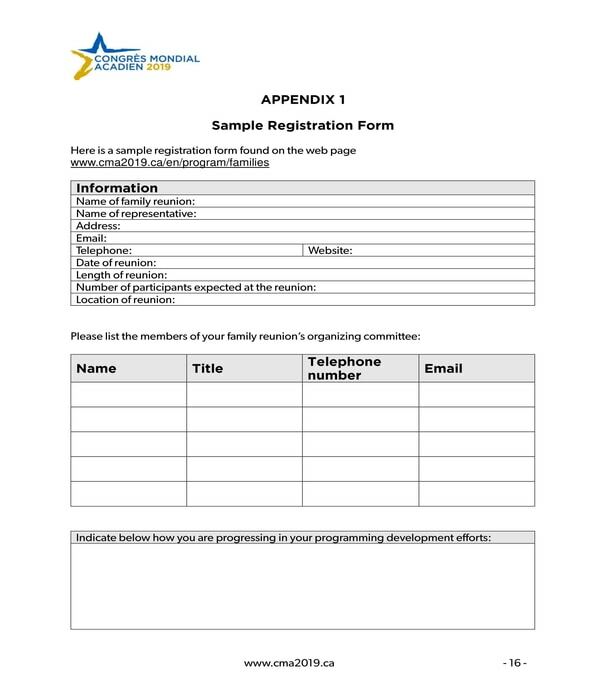 Family Reunion Volunteer Registration Form – Organizing a family reunion is not an easy task to accomplish especially if there are hundreds of guests and participants who are expected to join in the event. This is why the organizing party should welcome volunteers and service providers to lend a hand to ensure that the event will be successful. 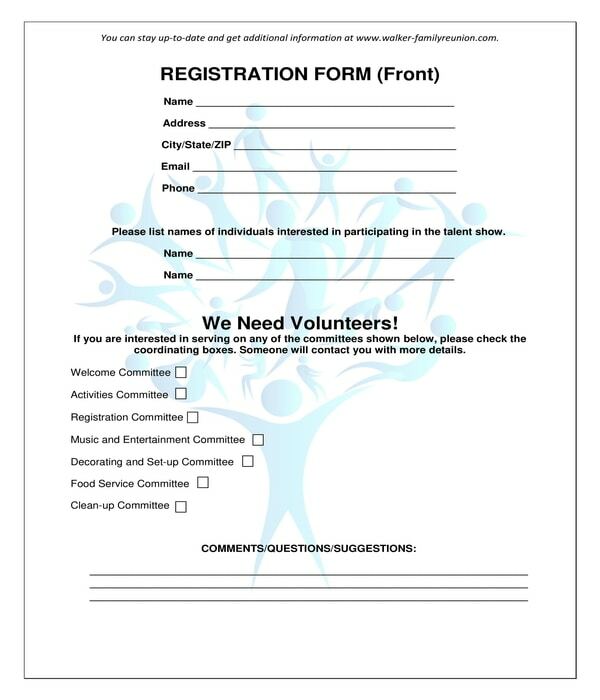 A family reunion volunteer registration form must be filled out and be submitted by the event volunteers. The form will document which committee the volunteer wants to take part in, and the contact details of the volunteer. Family reunion registration forms must be creative and engaging at the same time. Various design elements can be incorporated into the form. However, there must a theme for the event in order to have a common design goal. For instance, if the reunion will be held during the summer season, then tropical designs and colors can be used in the registration form’s fonts, tables, and margins. Check the alignment of the elements. It is important that elements in the form are all aligned, specifically the labels and the entry fields. To lessen the probability of misalignment, columns and rows can be used to create a table per section of the form. The borders of the table can then be made invisible by having it in the same color or shade to the background of the form. Guide and instruct the users. Include an instruction section in the form, especially at the top of each new section or part. This ensures that the form will be filled out effectively and that the user will know the relevance of providing the required data in the registration form. Family reunions don’t happen all the time which is why it is important to make sure that the event will be successful. And the first step to take is to record and enlist all the registrants who have submitted their completed family reunion registration forms. In addition, the form must be kept by the organizing committee, specifically for event feedback and evaluation purposes after the reunion.